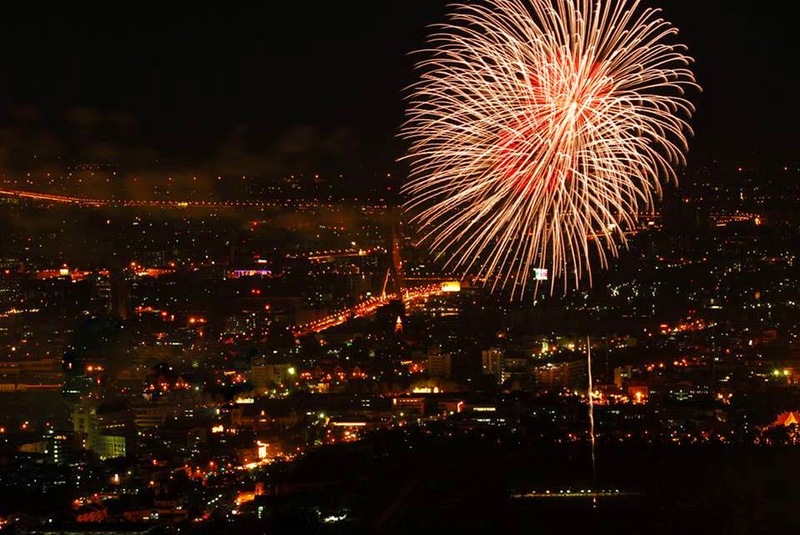 MANILA, Philippines - Beyond the traditional new year's eve (NYE) celebration are the countdown and special events happening around Mega and Metro Manila. On December 31, several establishments and companies will have their grandest welcome to 2015 and the year of Green Wooden Sheep through Countdown to 2015 festivities. Choose now where are you going as we compile once again the Top 15 places and events to celebrate new year's eve in the metro. Countdown to 2015 is definitely the best and meaningful event this year - full of fireworks, party peeps, bountiful banquet, music and revelry in epic proportions to usher in the New Year. 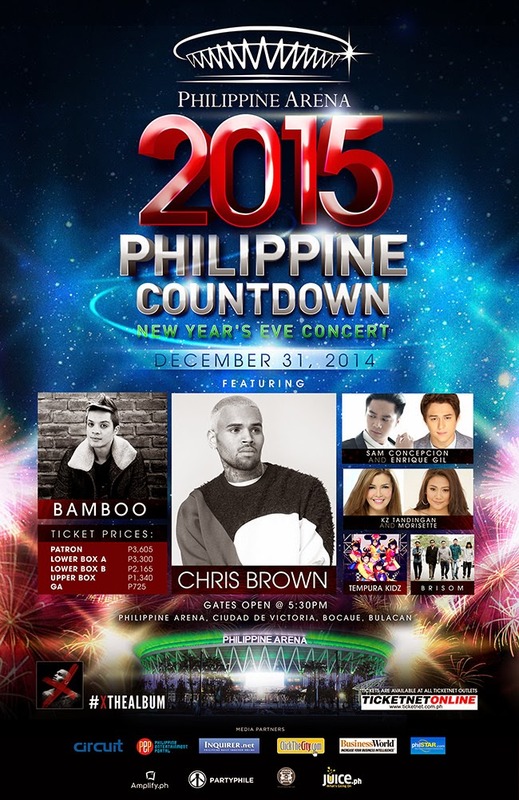 Experience the best of music to usher in year 2015. International and multi-platinum RNB dance sensation Chris Brown, along with Bamboo, Enrique Gil, Sam Concepcion, KZ Tandigan, Morisette, and Japan’s Tempura Kidz, are set to perform at The 2015 Philippine Countdown New Year’s Eve Concert. On Dec. 31, the massive gates of the world’s largest indoor stadium, the Philippine Arena, shall be opened to ticket holders who will get the once-in-lifetime experience of welcoming 2015 with the most celebrated mix of OPM bands and other world-class artists. Ticket holders not only get to witness big one concert, but may also watch the biggest and the most-stellar line-up OPM bands, featuring: Parokya Ni Edgar, Kjwan, Rico Blanco, Up Dharma Down, Callalily, SpongeCola, Itchyworms, Sandwich, Imago, 6CycleMind, Mayonnaise, Barbie Almalbis, Kitchie Nadal, Silent Sanctuary, and many more! On December 30, The Voice Kids, Shamrock, Hajji Alejandro, Asin, Willie Nepomuceno, Coritha, FBC Rebirth, Juan Rodrigo and Rey Valera will be performing live at the Philippine Stadium. Additional entertainment for the whole family includes parade, bazaars and all your favorite carnival rides and attractions. Tickets to The 2015 Philippine Countdown New Year’s Eve Concert is now available at Ticketnet. Get your tickets online at www.ticketnet.com.ph or at Ticketnet outlets. For inquiries you may also call the Ticketnet Hotline at 911-5555. Megaworld Lifestyle Malls and Eastwood City is celebrating the New Year with a bang through an Awesome line-up of spectacular performances and activities from the country’s brightest music stars at its New Year Countdown to 2015, the official New Year Countdown of Quezon City. Popstar royalty Sarah Geronimo will be leading the Eastwood - Quezon City New Year Countdown to 2015 on December 31, performing at 8PM at the Eastwood Mall Open Park. Named Yes Magazine’s Most Beautiful Star of 2014, Sarah continues to win both fans and accolades here and abroad, and was even tapped by Disney Channel to sing Tangled’s The Glow. Sarah Geronimo topbills an equally stellar lineup of performers, which include acclaimed Pinoy bands Pupil and Sandwich, popular teen stars James Reid and Nadine Lustre, pop singers Anja Aguilar and Jason Farol, who was mentored by AmericanIdol’s Kelly Clarkson in the American TV series Duets, internet sensation Donnalyn Bartolome, rapper Shehyee and Freestyle’s Top Suzara and Jinky Vidal. Hosting this year’s countdown are MTV Pinoy VJs Yassi Pressman, Chris Schneider and Kito Romualdez and ending the night with more awesomeness is DJ Ace Ramos. 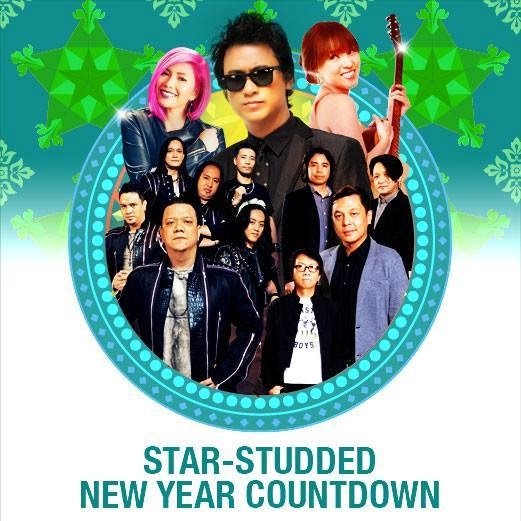 Start the New Year in an Awesome way with star-studded performances at the Eastwood - Quezon City New Year Countdown to 2015! For more information, you may call the Megaworld Lifestyle Malls Concierge at 709-9888 or 709-0888, 0917-8380111 or visit megaworldlifestylemalls website. Welcome 2015 with a bang! 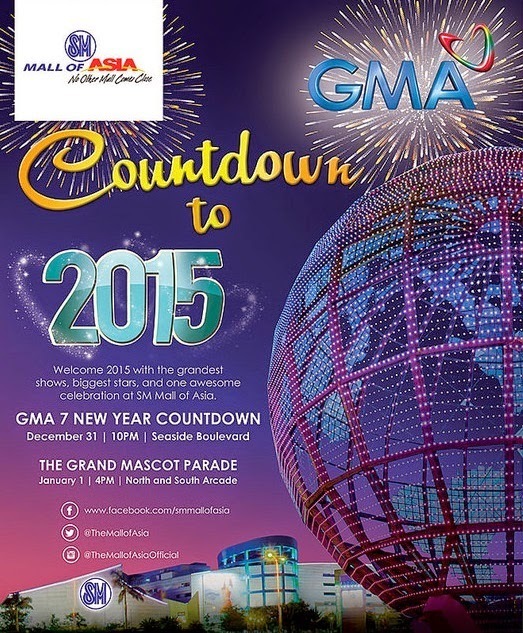 Take part in the most colorful and chic New Year celebration with Countdown to 2015: The GMA-7 New Year Special. Happening on December 31, 2014 from 10:00pm onwards at the SM Mall of Asia Concert Grounds. It will feature Chef Boy Logro and other big artists from the Kapuso network. 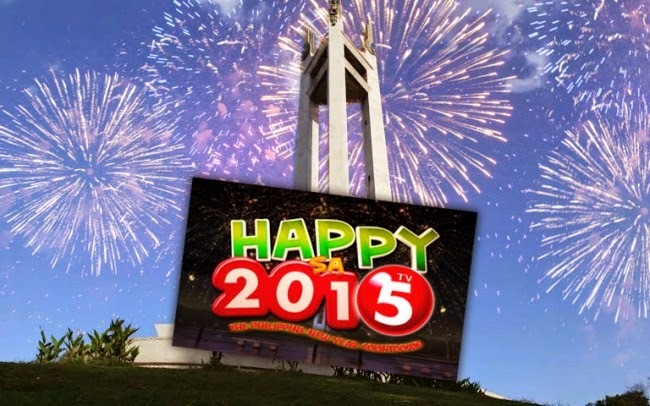 TV5 has partnered with the Quezon City government to welcome 2015 with the grandest New Year Countdown in the country. With the intention of “spreading happy and positive vibes” for the coming year, TV5 is preparing for the biggest New Year countdown. A whole day fair open to the public, the Happy Network’s countdown will be highlighted by a grand showcase of fireworks display and a 3D mapping show that is said to be at par with other famous New Year celebrations around the globe such as those at Times Square in New York, The Eye in London, Burj Khalifa in Dubai, and The Opera House in Sydney, among others. The countdown will be broadcast live at TV5 starting at 10:30 p.m. More details here. 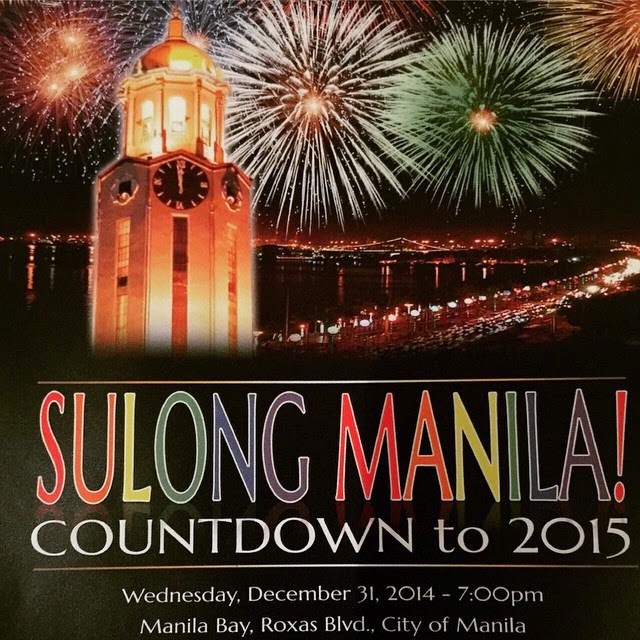 Manila will experience a unique and more festive new year countdown this year as the city government, headed by Mayor Joseph “Erap” Estrada, in cooperation with the Mare Foundation, will bring the country’s first-ever 3-D video mapping pyro/laser lights musical, Sulong Manila 2015 Countdown over the stretch of Roxas Boulevard on New Year’s Eve, Dec. 31. "An exciting line-up of performances by world-class acts, festive menus crafted by internationally renowned chefs, special Yuletide events and award-winning pyromusical extravagance awaits you!" 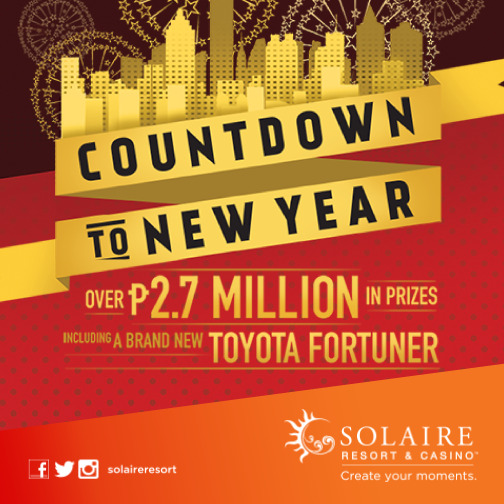 A brand new Toyota Fortuner is up for grabs as Solaire Resort & Casino ushers in the New Year! You could also win exciting gadgets and free play or slot credits. Every 100 points you earn from December 24. 2014 - January 1, 2015 gets you a ticket. Visit Solaire website for more details. Spectacular Pyromusical by the Manila bay at the strike of 12mn, presented by international award-winning pyrotechnic team. It can be viewed by guests at the outdoors area at the main lobby. "If you count yourself among the stars and you’re looking for a star-studded party on New Year’s Eve in Manila, then look no further. Resorts World Manila is once again bringing you its coolest party of the year with the Starriest New Year’s Eve Party! This one-night New Year’s countdown shindig will fill your appetite with the brightest star performers as well as various star-clad party goers. Starting off with Banda Kawayan playing Christmas classics using their traditional bamboo musical instruments, followed by a brilliant spectacle of lights and sounds with our country’s biggest indoor Christmas lantern display. Everything’s going to be a “starrific” blast from here onwards with the Dawn, Ely Buendia, Yeng Constantino, Mitoy and Draybers, Princess Velasco and the Main Cast Band, all of whom are going to rock and rouse you up in welcoming a lucky and prosperous New Year." Skye W High Street: "Ring in 2015 with a bang as #Skye brings you dynamic DJ duo DJ @raverepublic with support from @djedong, @kbhaw, and @djdavidardiente for our 4th annual #NewYearsEveParty this December 31st, Wednesday! The countdown starts at 10PM! Door charge is Php1,000 and comes with free drink. For table packages and reservations, please contact 478 4284 or 0932 856 7593." 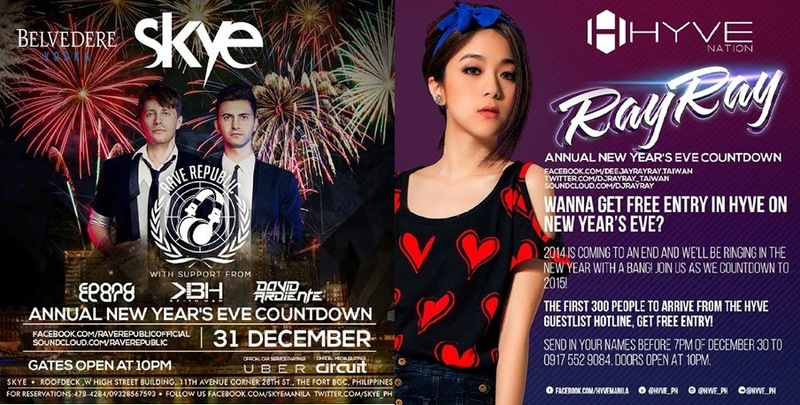 HyvE: "Let's all welcome 2015 with a bang this December 31st with DJ RayRay for our 2nd annual New Year's Eve Party! The FIRST 300 people to arrive from the Hyve Guestlist hotline get FREE ENTRY! Send in your names before 7PM of December 30 to 0917 552 9084. Doors open at 10PM." 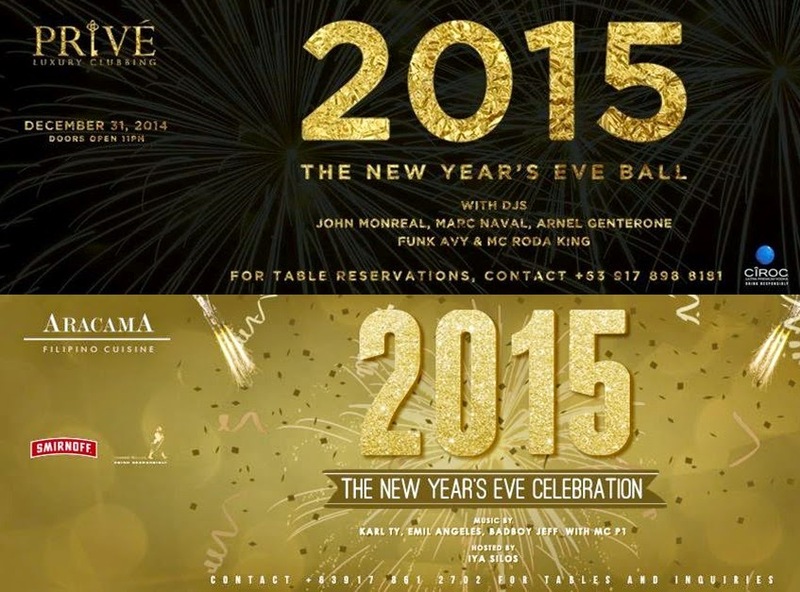 Prive: "Welcome 2015 at the Privé New Year's Eve Ball and get ready for a night you will never forget! Book your tables now at +63917.898.8181." Aracama Manila: "Join Aracama's New Year's Eve celebration with Karl Ty, Emil Angeles, Badboy Jeff and MC Millz. The event will be hosted by Iya Silos, Toby Benjamin and Charlie Alipio. Contact +63917 861 2702 for tables." "Countdown to 2015 at Manila's most luxurious ultra lounge with Pangaea Manila's Black & White New Year's Ball. Catch Chicago-based Jump Smokers plus music by #1 Bali-Singapore DJ Mikey Moran and our very own DJs Nina & Steal." For information and table reservations, contact +63 917 3813398 or email PangaeaTableReservations@cod-manila.com. End 2014 on a delicious note with a spectacular gourmet spread at Spectrum. Dine during the New Year's Eve dinner buffet and gain exclusive access to the 9th floor Pool Bar New Year's Eve Countdown Party. Guests can also choose to start the year right by partaking in a sumptuous New Year's Day brunch or dinner feasts. New Year's Eve dinner buffet is at Php 4,195 net per person (with access to the Pool Bar Countdown Party and glass of champagne). For more information, please call the Holiday Hotline at +63 2 555 9848 or email dining.makati@fairmont.com. While you're having a merry Christmas day with your loved ones, are you all set for New Year's Eve? It will be glitz, glitter and glam for 2014's final send-off party at The Lobby - the "Crystal" Gala Ball and Dinner. The Dinner Buffet is from 9:00 pm to 12 midnight; the Band plays from 9:00 pm to 2:00 am. For inquiries or reservations, please call (63-2) 887 2888 or e-mail: diningpmn@peninsula.com. Start the year right with a menu of activities celebrating 2015 featuring a petite à la carte selection consumable at Php2,500+++ from 6pm to 10pm and after-party access with tickets available at Php500+++ per person with a complimentary drink. Le Bar sets the stage for the annual New Year’s countdown and colorful balloon drop. Overlooking the magnifique Manila Bay, witness the burst of colors in the annual fireworks display officially greeting the New Year. Featured femme trio - The Zombettes spins hot tracks in a sensational countdown after-party. 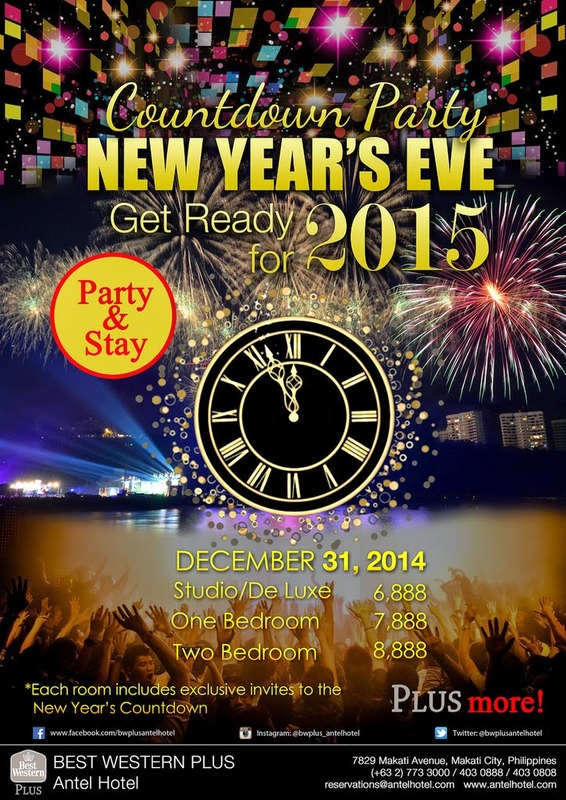 Free admission to the New Year’s Eve after-party for hotel guests and Le Bar diners. To make an online reservation or inquiry, visit here. 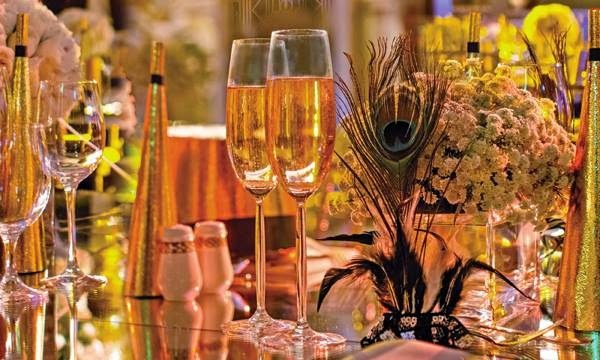 "Welcome 2015 with a lavish dinner at 22 Prime, and a Michael Jackson themed dance party at the Columbus Room on the 42nd floor. A stunning panoramic view of fireworks in the Metro Manila skyline caps off a fabulous midnight countdown. 15% discount for the first 30 tickets purchased on or before December 23, 2014. For inquiries, e-mail rsvn@discovery.com.ph or call (02) 719-6931 to 32." 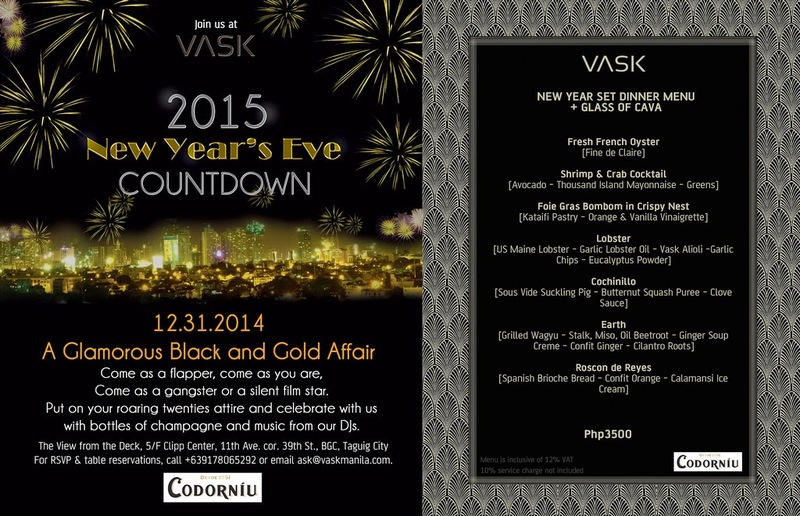 "Come join the countdown to 2015 and witness the most amazing view of the fireworks at the Deck. Witness the perfect view of Rockwell Makati, Bonifacio Global City and Ortigas! Come and celebrate 2015 with with bottles of cava and music from Vask DJs. For table reservations, you may call: 09178065292." "Enjoy the buffer dinner, live band and WIN from our raffle prizes. Most of all, stay with the people who care." 1. For Makati residents, the New Year’s Eve Countdown and Street Party usually held along Ayala Avenue has been cancelled this year. Instead, the Makati city government is planning to donate the event’s hefty budget of PHP 30 million to the victims of Typhoon Ruby. 2. ABS-CBN New Year's Countdown is Live on Bandila on Wednesday night. It will cover all the New Year's Eve Festivities around the Metro. 3. Photos and information presented above are from official Facebook pages and websites of different establishments or companies with New Year Countdown to 2015. TheSummitExpress.com compiled the top 15 places and events for the benefit of its readers. Share now this post if you find this informative. Like Us on Facebook or Follow Us on Twitter for more interesting and original stories. 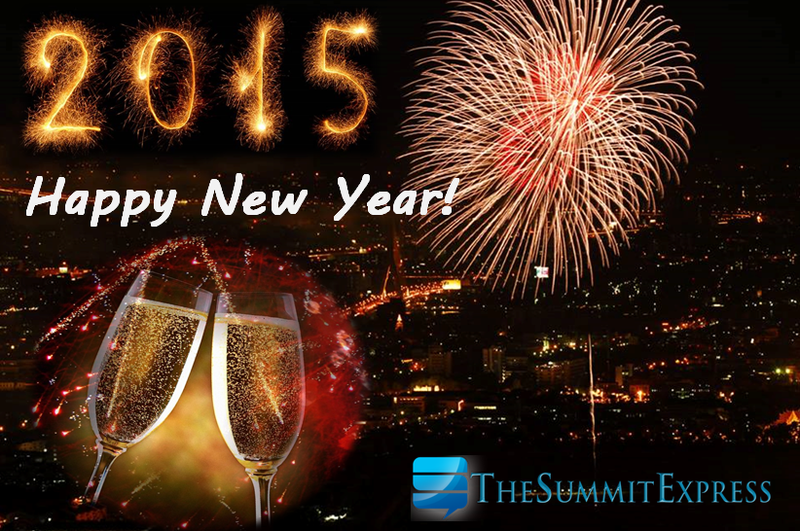 Happy New Year my dearest thesummitexpress.com readers!